Happy Friday night all! Well, this has been a stamper's dream week for me! Thank you God for this because my week otherwise was not so fun. But I am going to focus on the wonderful gifts He has given me this week! First of all, I received the new Our Daily Bread designs sets for November and they are so gorgeous! I've already shown a couple of peeks, but please come back on Sunday to join our blog hop fun and new challenge! Then I found out that I had won one of the random prizes from the Midnight Madness Blog Hop!!! Thanks ladies!!! I also won a Taylored Expression stamp set from the Stampin ' Sisters in Christ Blog! Wow! Thank you all too! And last but certainly not least, I was asked to guest design with the Midnight Madness Team during the month of November! Now is that a cool week or what?!!! I am still pinching myself!!! I used Almost Amethyst and Lavender Lace with Black and White. I scored a lattice pattern with my scor-pal. I layered several spellbinders diecuts, sponged the white circle while still inside the die. The images are from a stamp set by Inkadinkado called Fancy That. I outlined the sentiment and colored the butterflies with copic markers. I added lots of rhinestones and then sprayed it all with Glimmer Mist! and leaving me such sweet, wonderful comments! Hey again! I made this for this week's Midnight Madness sketch and today's color challenge of Kraft, Black and Melon Mambo! And, this is another sneak peek of the new sets being released on November 1st by Our Daily Bread designs! 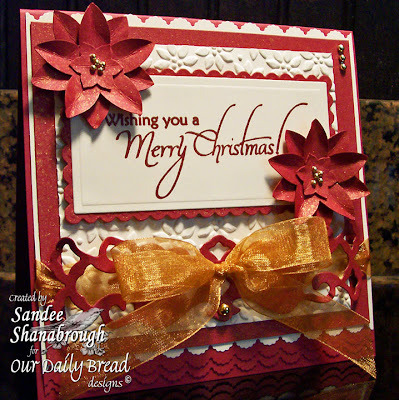 I first stamped and colored the poinsettias with a Melon Mambo marker. Then I sprayed them and the Mambo layer and Kraft strip with Marshmallow Glimmer Mist! I am so addicted to this stuff! The Marshmallow color sort of gives the poinsettias a snow glistened look. I wish you could see the glimmer and shine! My photography skills are so lacking! You can't even see the cute little bow with the black velvet ribbon! Well, maybe one day I'll figure it out! Anyway, I finished it with the black pearls. I wanted this to be a quick card so I didn't do the poinsettia layers like on my card yesterday, but I really wish I would have taken the time to do that. Maybe next time! for our release day blog hop. Hint, hint...there will be prizes!!! Hi!!! Here is a sneak peek of two of the fantastic new sets from Our Daily Bread designs! Kelley has done it again y'all!!! I have wanted a Poinsettia stamp forever!!! Now, if there's not a blue poinsettia, there should be right?! I used this gorgeous SEI paper along with a gorgeous piece of Prism Metallic copper paper to dictate my color choices. I embossed the sentiment with clear powder and layered this with a Spellbinders Label which is sponged on the edges with Not Quite Navy. The border is punched with Martha's lattice punch and sponged. I stamped and cut out the poinsettia on Bordering Blue paper and sponged with the Not Quite Navy . All of the flower layers are sprayed with Gold Glimmer Mist. Then I used Martha's punch for the little twiggy things. Gold organdy ribbon, gold cording and gold pearls finish this off! I really love these new sets and you will too! Don't forget to check in on the first for a fun challenge and blog hop! Also, I wanted to mention to y'all that I won one of the random prizes from the Midnight Madness Blog Hop! YAY!!!! I am so excited! Can't wait! Thanks MMSC Team!!! Hope all of you have a great night! Thanks for coming by for a visit!!! Well, the weekend is over! Back to the grind tomorrow! haha! I wanted to get this one in for the Featured Stamper Challenge today. The honor goes to Rachel today! Great gallery she has there! I chose this card to case. I changed the colors, theme and stamps. I cuttlebugged the designer paper and used ribbon instead of the rhinestones. Still working on those Christmas cards people!!! Hope you all have a wonderful week! Thanks for stopping by! Hey y'all!!! I made this card this morning for the Inspiration Challenge and yesterday's LSC but didn't have time to blog it until now. I used this cute blouse for my inspiration. And the LSC was to make a girlie card with no designer paper. This is pretty girlie! I chose to create another Christmas card for the stash. 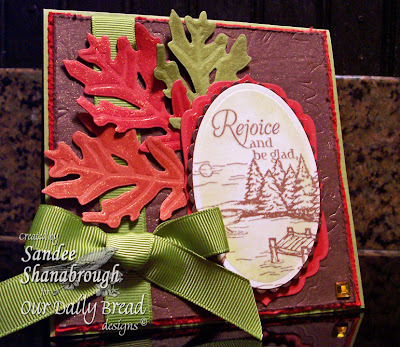 I used a sentiment from the Joy to the World set from Our Daily bread designs. I used an EK Success border punch, the Spellbinders Lattice border and long rectangles, two SU! flower punches, SU! embossing folder, Gold Glimmer Mist, gold organdy ribbon and gold pearls. For my little poinsettias, I folded each petal before glimmerizing them and then layered them to make the poinsettias! Lots of layers but pretty easy to put together! The cardstock is Bravo Burgundy and Vanilla. Thanks for looking! Hope you have a great night! Oh and be watching for the November releases from Our Daily Bread designs! You are all gonna flip out because they are so gorgeous!!! Maybe there will be a few sneak peeks!!! Good Morning! Hope all is well! The Midnight Madness Sketch this week is really a fun one! I made another Christmas card!! The colors I used are from this week's color challenge too. Always Artichoke, Bravo Burgundy, Vanilla and Cameo Coral. 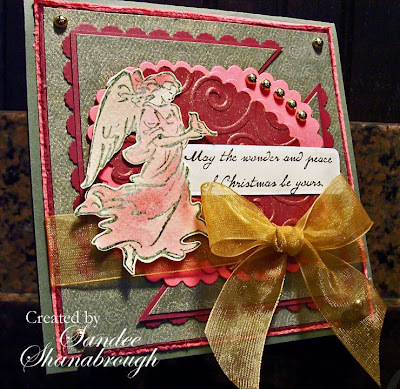 I love this retired Angel set from StampinUp! I embossed her onto watercolor paper, sprayed the paper with water and used a brush and re-inkers to watercolor her. I sprayed all of the pieces with Gold Glimmer Mist and added pretty gold ribbon and pearls! Hope you all have a wonderful day! Thanks for taking time to visit me today!! oh night when Christ was born! Hi everyone! I made this card for two challenges. This week the Stampin' Sisters in Christ issued a challenge to make a Christmas card featuring an image which reminds us of what Christmas is really all about. I love this image and sentiment from two sets by Our Daily Bread designs called Worship the Lord and Reason for the Season. I colored the church image with copic markers and a white gel pen. Then masked the moon and sponged the night sky. Then added stickles! The designer paper is from a Hobby Lobby pack. I cuttlebugged the black designer paper with snowflakes. All of the designer papers are sponged. 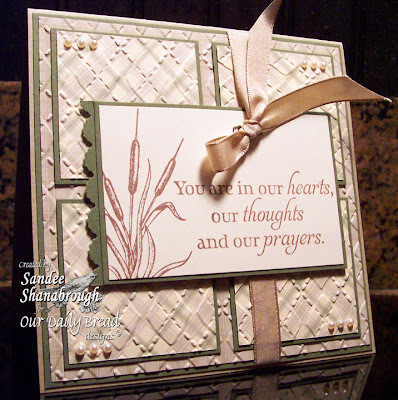 The sentiment was masked, cut with a spellbinders die, and sponged while still inside the die. Finished with black velvet ribbon. 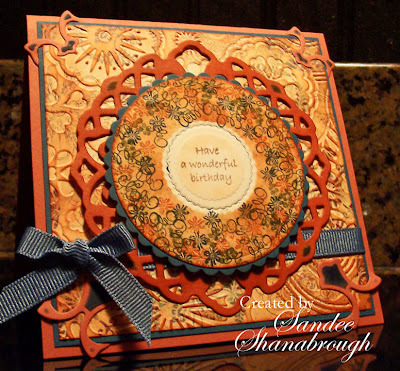 The sketch is from a card made by this week's Featured Stamper, DancerRiley! This is the card I cased. I changed to a square card and used all different colors and stamps and added a sentiment. Ok, one more card ready to go!!! I appreciate your visit!! From the moment I saw this week's sketch at Midnight Madness, this idea has been swirling around in my head. 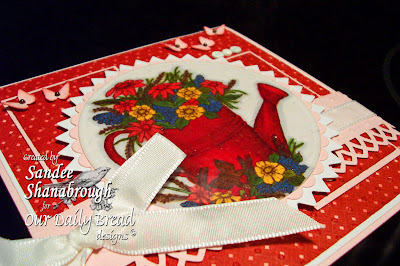 I knew I was going to use these Spellbinders leaves with this beautiful Our Daily Bread designs image but I didn't necessarily want it to be a sympathy card either. So this card shows once again how versatile these stamp sets can be. I only used a portion of the sentiment that comes with this set called With Deepest Sympathy. The beautiful colors of fall gives us another reason to Rejoice and Be Glad!!!! I embossed the Chocolate Chip layer with a Spellbinders leaf and then cut, embossed and sponged the other leaves. I stamped the image and masked the sentiment and then cut out all the Spellbinders layers. I sprayed all of those things with Gold Glimmer Mist! Wow I just love that stuff! However, I should have sprayed the background and let it dry before embossing because the pretty, deep impression sort of disappeared! Anyway, I distressed the edges of the background layers with a distressing tool, added the Olive ribbon and then put all the pieces together. The pretty gold rhinestone was the last thing to embellish this card. Thanks to the team at Midnight Madness for another great sketch to work with. And thanks to all of you for visiting! Hope you all have a wonderful weekend! 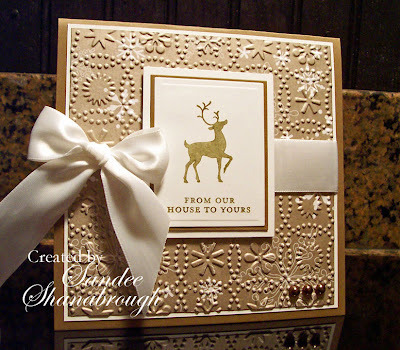 I started by embossing a piece of designer paper by The Paper Studio. Then the Lattice Spellbinders pendant, layered up with more Spellbinders dies. I stamped and sponged, added the extra pendant pieces in the corners and ribbon. This is one busy card! I am so thankful for my playing time today! Busy card or not! Thanks for stopping by and hope you have a great Thursday! Hi there! This is for the sketch challenge today! Haven't done a SCS sketch in a while so when I saw that the sketch being provided was inspired from a card created by my friend Angella, I went right to work! The stamps I used are from two of the three sets released this month from Our Daily Bread designs, called Praying for You and With Heartfelt Sympathy. The dragonflies were cut out and sponged with Soft Sky and Chocolate Chip and then sprayed with Glimmer Mist. The sentiment was masked to fit onto this smaller area. My Stamp-a-ma-jig really comes in handy for this type of thing! I added EK Success punched borders, a pretty white bow, and three tiny brown pearls. Thanks for a great sketch and inspiration! And thanks y'all for coming by today! I love having you visit! I'm back! I made this card this afternoon but just now getting it posted. I used this week's Midnight Madness Sketch and the current Dirty Dozen Monthly Theme, Winged Things. I combined two of the three October releases from Our Daily Bread designs, With Heartfelt Sympathy and With Deepest Sympathy. I never bought the Baja Breeze ink to match the Parisian Breeze designer paper, so I used Soft Sky re-inker to stamp the image. I used the re-inker because I also don't have that ink pad either but what I do is scribble the ink onto an acrylic block and tap the stamp into the ink and then stamp! It usually comes out a little fuzzy or dreamy looking instead of a crisp impression but I like the look! I then stamped the sentiment over this with Memento Brown. I pierced around the edges so that I could sew with linen thread. For the three corners, I pierced the holes and tapped a Chocolate Chip marker on the holes to give the look of eyelets and added the linen thread. For the dragonflies, I stamped again with the re-inker, sponged the edges and then sprayed them with Pearl Glimmer Mist. Then I added all the brown pearls to finish the card! Loved this sketch! Thanks MMSC!!! And thank you for visiting with me again tonight! Enjoy your week! Today is Columbus Day so I am off for the day! And, since it is raining cats and dogs, what better way to spend my time than stamping! The Technique Lovers Challenge today is to make an easel card! I had never made one before and I am surprised at how easy it is! 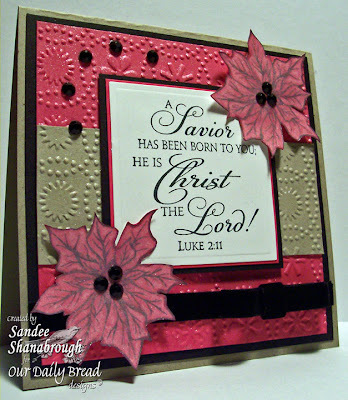 Also, this week over at Stampin' Sisters in Christ, the challenge is to make a baby card. I started with white for my base and used a piece of Pink Pirouette designer paper, inside and out. I added a border along the bottom made with the Martha Loop punch and a cuttlebug embossed button border. I inked the baby shoes with Creamy Caramel and rock-n-rolled in Pretty in Pink before stamping. The sentiment on the front is from SU! 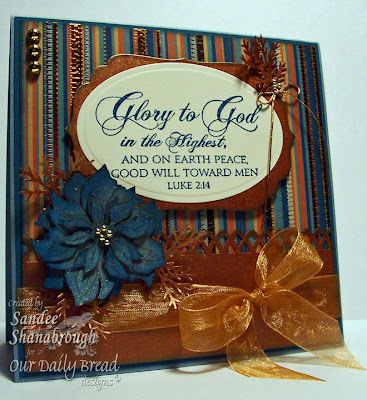 God's Blessings and the inside sentiment is from Our Daily Bread designs set called Children of God. I wish that I had thought far enough ahead to sponge the edges of the designer paper and the little flowers before putting everything together! Oh well! I used Martha's loopy corner to do the thingie under the ovals. Just had to trim part of it off! Added the little punched flowers and brown pearls, and the button on the inside to hold the easel up! Fun technique! I will use this again! Thanks for looking and have a blessed day! 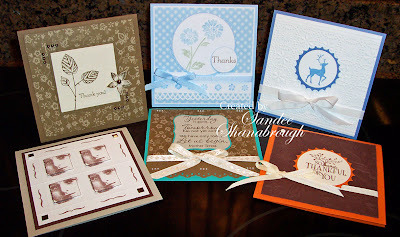 Today, fellow breadstick and a sweet friend, Chris, is the Featured Stamper on SCS! Way to go, Chris! If you haven't visited Chris before, what are you waiting for?! She does amazing work!!! I chose to case this beauty. I loved her design and the colors! So, I kept the Bermuda Bay, the birthday theme but changed the stamp sets to SU! Gods' Beauty, and God's Blessings and used Chocolate Chip for the base and accents color. I pierced instead of sewing. I used a different Spellbinders pendant and different border punch. For the butterfly, I stamped with Memento Brown, coloring some of the areas with Bermuda Bay marker before stamping and then cut it out. I sponged the edges with Chocolate chip and then sprayed it with Pearl Glimmer Mist. Loved your card Chris! Thanks for the inpiration! Thanks for stopping by again y'all! Have a great week! Hey everyone! Hope all of you are having a great weekend! I made this card for two challenges this week. The Ways to Use it Challenge and the Inspiration Challenge. For the WT, the challenge was to make a card using our world as the inspiration. One of my favorite places to be is in the North Georgia mountains with the beautiful trees and fresh air. This little scene reminds me of the little pond nestled in the mountain property that has been in our family for many, many years. My grandparents lived there in a wonderful little country home with a tin roof and huge front porch. I spent many happy summers there. Now, my parents live on this land and one day, we hope to live there too!! Can you just imagine the peace and quiet?! Anyway, back to the card! haha! I was also inspired by the beautiful greens of some of the jewelry from the inspiration challenge. 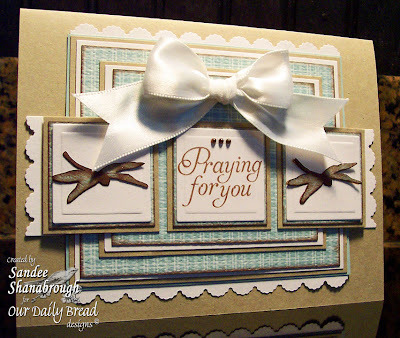 I used two of the new October sets from Our Daily Bread designs, With Deepest Sympathy and Praying for You. I stamped the image and sentiment on white and sandwiched this piece between a layer of Always Artichoke and Mellow Moss. I cut frames from the moss layer with Spellbinders dies and ran this through my cuttlebug to emboss it before putting these three layers together. I outlined the image and sentiment areas with a copic marker #BG39. I added a nestie frame, cuttlebug corners and then I sprayed the whole thing with Glimmer Mist (Olive on the moss layer before attaching and then pearl over the whole thing including the stamped areas). I added teeny little pearls too to finish the card! Thanks for looking! I appreciate your visits so much! Have a great week! Today is a very special day! Kelley, the owner of Our Daily Bread designs is celebrating her birthday! So I made this card for her. This beautiful ODBD image was released a couple of months ago and I really enjoy coloring it! I used copic markers to color it and then I used several layers of versamark and clear embossing powder to create the glassy look (not sure if you can see that in these photos!). I embossed the SU! designer paper with a cuttlebug folder and sponged them with Riding Hood Red ink. 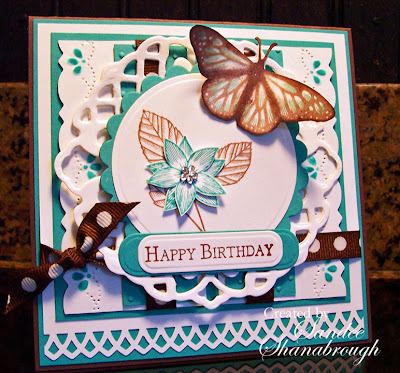 I added an embossed border punched with a Martha border punch and finished the card with ribbon, brads and Martha butterflies. This sketch is from this week's Mojo Monday sketch. 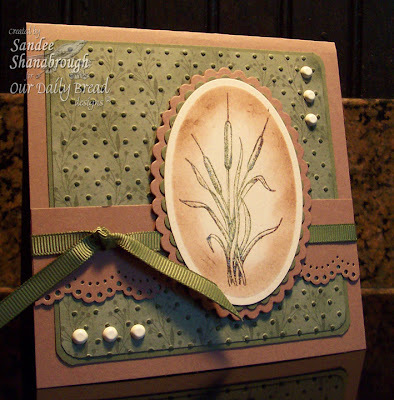 Also, the Stampin' Sisters in Christ challenge this week is to create a card showing how the earth rejoices. One way that God shows His love for us is in the beauty of flowers, butterflies and the colors of nature. With the craziness and ugliness in our world, we need to stop and take in the beauty that surrounds us. Smell the flowers, watch a butterfly, see the colors of nature and remember that God is still here. Kelley, I hope that you have a wonderful birthday! Featured Stamper, World Card Making Day, Etc! Hi everybody! Hope your Sunday was wonderful! I've been busy this afternoon. 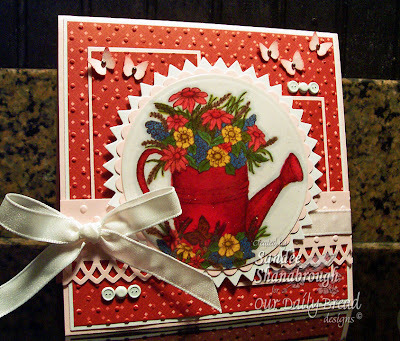 I started with this card for the Featured Stamper challenge today. I had a great time going through Lois' gallery searching for a card to case. I found this one and loved it! I kept similar colors and used one of the new stamps from Our Daily Bread designs which is similar to the one Lois used. I added more layers, embossed the designer paper, and sponged. I only used one layer for the lacy border and added ribbon! Thanks Lois for inspiring me! Yesterday was World Card Making Day! I was able to play in six of the challenges today! Yay! If you would like to see these closer, I'll have them individually added to my SCS gallery in the next few minutes! I also wanted to say thanks to some very sweet people! Last week, I was given the Shining Star award from the Stampin' Sisters in Christ Blog and I was also featured on the Inspirational Blog! WOW!!! You all made my week! I thank you so much ladies! Hope you all have a great week! Thanks for stopping by and see ya soon! Good Morning!!! It's a beautiful day and I have another card using one of the beautiful new collection of stamps from Our Daily Bread designs to share with you! Kelley has added three new sets this month. All of the sets are great for those times when we need to let someone know we care and are thinking about them. 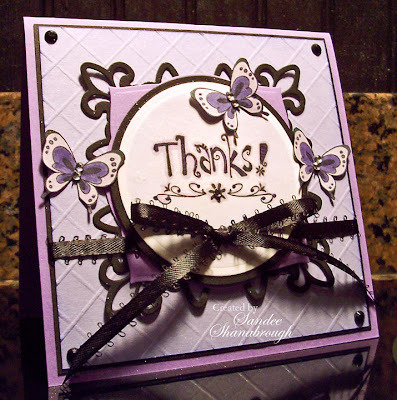 Today I am showing you a card made with a set called With Heartfelt Sympathy. 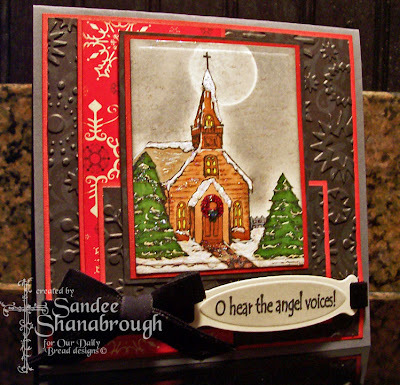 I used this week's Midnight Madness sketch and this week's Stampin' Sisters in Christ Challenge to make a card to let someone know you care. I started with a base card of Kraft paper. I used my cuttlebug to emboss the designer paper. I used an EK Success border punch along the edge of the sentiment panel and added Kraft ribbon. Notice I tied only a half bow! First time I did that, (it was an accident) but I liked the way it looked! Then I added pearls in the corners to finish the card. 2. What you liked best about these new sets! This hop will be open for comments until 6PM EST Friday Oct 2. Grace will announce the winners on the ODBD Blog on Sat. Oct 3. So don't forget to check back on the ODBD Blog to see who won! and a $20.00 Store Credit! These credits will be for any merchandise in the Our Daily Bread Designs Store! How's that for great prizes!!! Hope you have fun hopping with us today! Can't wait to see who wins!! !